Our lace ribbon is meant for all creative people who can make something beautiful with these ribbons. 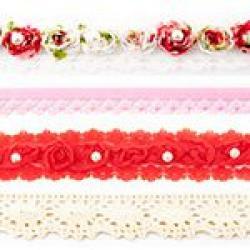 We have lace ribbon with flowers, pearls and in many colors. Lace ribbon is sold per meter. Lace Ribbon Cotton 25mm - Black..
Lace Ribbon Cotton 25mm - Dark Grey..
Lace Ribbon Cotton 25mm - Purple..
Lace Ribbon Cotton 25mm - Dark Blue..
Lace Ribbon Cotton 25mm - Red..
Lace Ribbon Cotton 25mm - Fuchsia..
Lace Ribbon Cotton 25mm - Light Pink..
Lace Ribbon Cotton 25mm - Old Pink..
Lace Ribbon Cotton 25mm - Aqua..
Lace Ribbon Cotton 25mm - Light Blue..
Lace Ribbon Cotton 25mm - Mint..
Lace Ribbon Cotton 25mm - Sand..
Lace Ribbon Cotton 25mm - Light Grey..
Lace Ribbon Cotton 25mm - Ecru..
Lace Ribbon Cotton 25mm - White..
Lace Ribbon Rose and Pearl 30mm - Multi..
Lace Ribbon Rose and Pearl 30mm - Black..
Lace Ribbon Rose and Pearl 30mm - Grey..
Lace Ribbon Rose and Pearl 30mm - Pink..